Drug abuse is on the rise across the country and truck drivers are not immune to this unfortunate trend. In fact, a trucker’s lifestyle makes him even more susceptible to the seduction of drug use—specifically prescription drug use—than other drivers. According to the National Institute on Drug Abuse, prescription drug abuse is the intentional misuse of regulated medication in a way other than prescribed or for the specific reason to feel its effects. For instance, people abuse pain relievers, tranquilizers, and stimulants to feel “high,” forget their problems, or feel numb to outside influences (physical and psychological). Truck drivers, on the other hand, tend to abuse prescription drugs for the sake of their jobs. Truckers must drive for long periods of time without breaks in order to make deadlines. Unfortunately, this lifestyle can take its toll, both physically and mentally, as drivers ignore exhaustion to cover more miles. 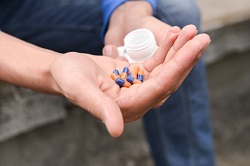 To combat the effects of fatigue, many truckers take prescription stimulants such as ADHD or narcolepsy medication in the hope that they will make them more alert and energized. Although this type of dangerous behavior can put themselves and other drivers at risk, the pressure they get from their employers to make deliveries on time causes some drivers to ignore these potential consequences. If you’ve ever taken a road trip or had to drive for longer than two hours, you know that sitting in one position for too long can wreak havoc on your body. In addition to back pain and spasms from a rigid posture, your legs and hips cramp up from constantly moving your foot from gas to brake and brake to gas. Now imagine this pain and discomfort amplified as a result of routinely driving twelve hours or more a day. It isn’t pleasant. Consequently, many truckers will take (and abuse) prescription-grade medications to relieve some of these discomforts. Furthermore, once these drivers begin taking these powerful pain-relieving drugs, it’s hard to stop. Worse, many painkillers carry warnings against taking them when operating heavy machinery. You don’t get much heavier than a semi. There have been instances of drugged drivers losing consciousness, overdosing, suffering cardiac arrest, or dying while maneuvering their rigs right there on the highway. Although there are some perfectly legitimate and legal ways to handle fatigue and pain, abusing drugs is not one of them. Whether a truck driver chooses to take drugs for energy, focus, or recreation, getting behind the wheel while on drugs is illegal and extremely dangerous. Due to this fact, as well as the growing number of truckers guilty of drug abuse, the Federal Motor Carrier Safety Administration (FMCSA) is working to create the National Drug and Alcohol Database. This database will work to ensure that a trucker’s failed or refused drug test becomes a permanent, accessible record for employers. If you believe that the driver who caused your truck wreck was impaired or had abused medication or drugs, reach out to our firm today via live chat to get the answers you need quickly. The truck driver’s negligence could be grounds for a suit in which you could seek financial compensation for medical bills, lost wages from missed time at work, and even pain and emotional suffering. For more information about how these cases work, call the office of Attorney Steve Lee today at 800-232-3711 or fill out the quick contact form on this page.